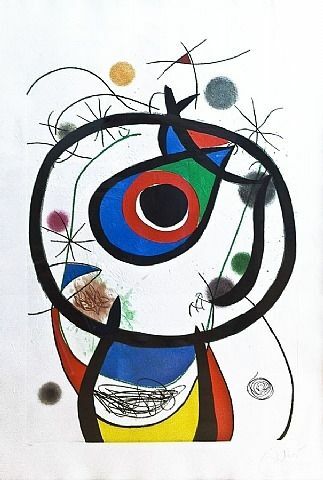 Spanish Contemporary Artist Joan Miro is revered for a unique body of work featuring dreamlike scenes – often marrying surreal and minimalist elements. The artist, whose life spanned 90 years from the 1893 to 1983, has had a profound influence on many of the great postwar American Contemporary artists and his legacy continues to inspire ambitious levels of creativity for Modern Artists worldwide. 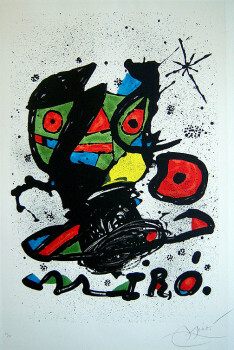 Miro’s life and art were dramatically impacted by his close proximity to two World Wars and the Spanish Civil War. While the harsh realities of human struggle were represented within his art, it was Joan Miro’s whimsical themes of the subconscious that produced an undeniably attractive appeal. Miro’s works leave many viewers feeling as if they’ve read the first chapter of a book or the first stanza of a poem – opening space for them to complete it. It’s also plausible that all of human conflict experienced by Joan Miro fueled a rebellious artistic spirit. Like the Fauvist, Cubist, Surrealist and Dadaist Artists who influenced him, Miro too sought to create art that pushed boundaries, rebelling against established notions of acceptable form. Like many talented artists living in the early 20th century, Joan Miro made his way to Paris, settling in 1920, but remaining strongly committed to his Catalan roots and traveling back to his homeland regularly. Between 1921 and 1922, Miro completed a number of paintings that he started at his family’s summer home on a farm in Mont-roig del Camp in Catalonia. One such painting, that the artist himself considered to be his first true masterpiece, was The Farm − a work that took nine straight months of work in Paris to complete. Ernest Hemingway, who eventually purchased the painting, was so enthralled with the work that he publicly sang its praises. With mutual respect for each other’s talents, Hemingway and Miro became friends. In France, Miro also developed a close relationship with Surrealist writer Andre Breton, and in 1924 he formally became a member of the Surrealist movement that Breton championed. Among the Surrealist practices that would influence Miro’s work was the act of “automatism” − promoting a stream-of-consciousness style of creation − seeking to uncover truths that were uninterrupted by cognitive thinking. 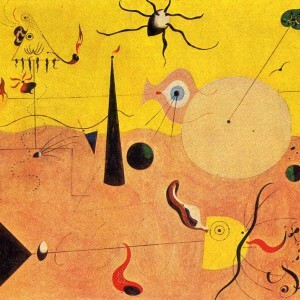 The adoption of this technique enhanced the dreamlike qualities of Joan Miro’s works, which became even more fanciful and fantastic. While Miro’s art embraced elements of abstraction and surrealism, the artist’s unique style continued to be one that toggled the line between earthly forms and the creations channeled by imagination. The Hunter (Catalan Landscape) is one of Joan Miró’s first paintings classified as Surrealist and it provides ample references to the forms and symbols that the artist would continue to employ in works developed over the following decade. 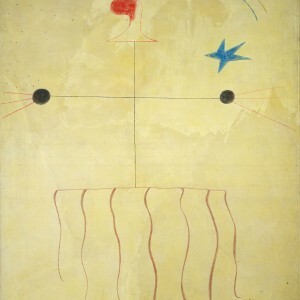 Miro described that it was himself represented as the Catalonian subject in The Hunter – with triangular head, mustache and pipe. Miro’s works were regularly interpreted for their social commentary regarding acts of war, politics, territorialism and nationality – all of which are recurring. The principle character in The Hunter would also become representative of the artist’s fellow countrymen in a series of Catalan Peasant works created in 1924-1925. These works feature the hunter consistently portrayed with a traditional Catalan red cap, scraggly beard and soulful eyes that appear to allude to a larger story. Because of the oppression imposed on Catalonians by dictator Miguel Primo de Rivera in the 1920s, inferred political statements within Miro’s works added layers of emotional interpretations. Many of the artists works throughout the 1930s reflected a sense of sadness and depression living within an artist coping with war and unrest. The decade would begin happy enough for Miro, who after marrying Pilar Juncosa in 1929, enjoyed the birth of his daughter in Paris in 1930. 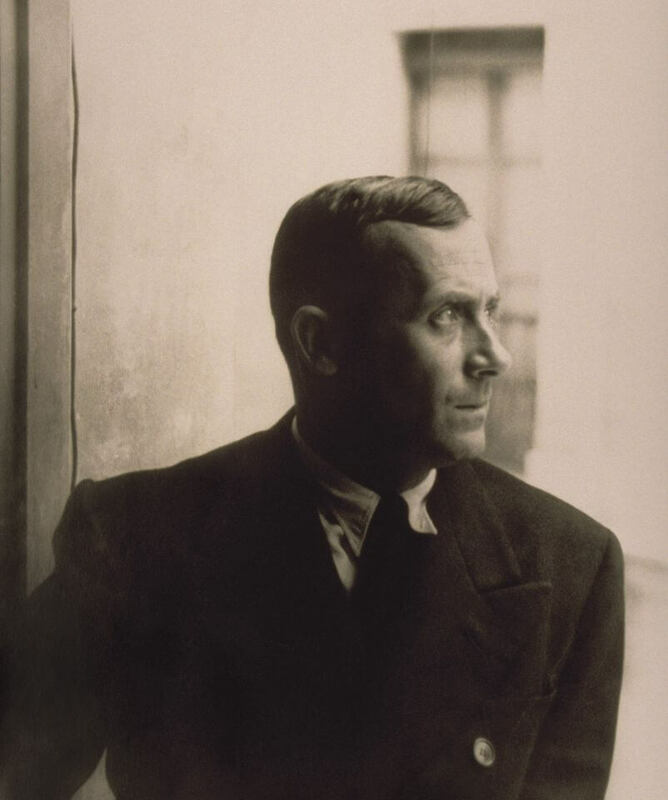 Following the rule of Primo de Rivera, Miro and his young family moved to back to Spain, living in Barcelona. However, the conflicts leading up the Spanish Civil War drove them back to Paris by mid decade. 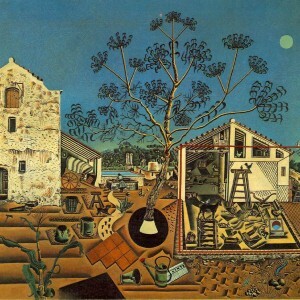 The family would be uprooted once again in 1939, as they left France to escape German invasion and relocate back to Spain once more – this time living with Miro’s in-laws on the island of Mallorca. In 1945, a New York exhibition featuring Miro’s Constellations series of works won the artist great acclaim and appreciation from an American Contemporary Art audience hungry for such unfiltered creativity. Miro made his first trip to New York in 1947 and was greeted as a living legend and catalyst impacting a new wave of Modern Art in America. Over the following decades, his work would be acknowledged as an important influence for Abstract Expressionist and Color Field Artists, including such famous masters as Alexander Calder, Robert Motherwell, Jackson Pollock, Mark Rothko, Helen Frankenthaler and many others. 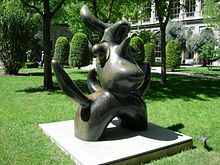 Jean Miro has produced an impressive array of sculptures, murals, lithographs and tapestries that grace gathering places in many of the world’s greatest cities, including Madrid, Barcelona, Paris, Milan, London, Chicago, San Francisco and New York. 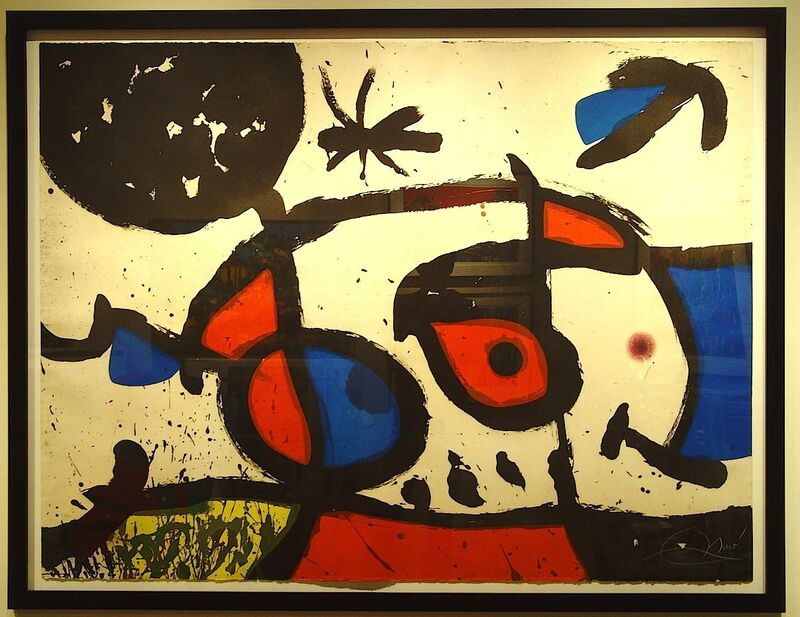 A large tapestry (20 x 35 feet), created by Joan Miro and Josep Royo, was on display in the lobby of 2 World Trade Center (New York City) from 1974 until it was destroyed by the infamous 9/11 terrorist attack in 2001. The Hunter (Catalan Landscape), 1924. Oil on canvas, 25 1/2 x 39 ½ in. Joan Miro’s first show in Paris, in 1920, was a big disappointment for the artist. No one showed up and no paintings were sold. After the show, Miro went back to his home in Catalonia and began to incorporate what he had learned from the avant-garde artists and writers he had met in Paris with his own sensibility.The result was The Birth of the World, a painting that combines whimsical forms and intense colors, which would become his signature style. Ironically, The Birth of the World was not well received by Miro’s friends or art dealers. Belgian art collector, Rene Gaffe, bought it in 1925 and kept it stashed in his private collection, exhibiting it only once, in Brussels, in the 1930s.